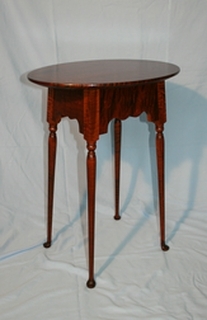 Established in 1995, we specialize in custom-built hardwood furniture. Our goal is to provide you with both custom furniture and a custom furniture experience, where, as in days of old, you know the craftsman on a personal level. On our site, you'll find a lot about who we are as a company as well as examples of the sort of things we create on a daily basis. When you're ready for affordably priced, custom built furniture, go ahead and drop us a line. We'd love to become your trusted, personal furniture maker! a breadboard end. February, 2016. "Ron Light, of Lighthouse Woodworking, mentioned in 'Serving 2.0 - Veterans in the Urban Forest'"
Ron Light, co-owner of Lighthouse Woodworking, is mentioned in the new Va. Dept. of Forestry publication, "Serving 2.0 - Veterans in the Urban Forest," which is now available on the Dept. of Forestry website as a downloadable PDF. "Local family to shed light on how solar systems work"
Ron and Beth Light, the owners of Lighthouse Woodworking, will open their home and business on Oct. 20 to anyone who wants to see how a solar electricity system functions. 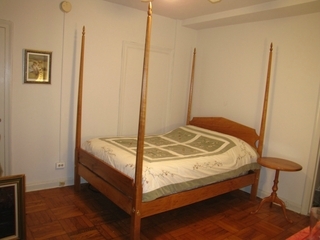 "We have had our pencil-post bed for two years now, and we absolutely love it. 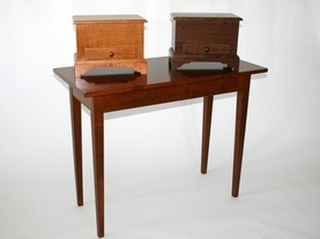 The solid cherry has aged beautifully to a deep, rich red, and the bed has been the object of many compliments. We relocated recently, and disassembling and re-assembling the bed was a very smooth process. We look forward to having this stunning piece in our family for generations to come!" Kenny and Jennifer D., Philadelphia, Pennsylvania. 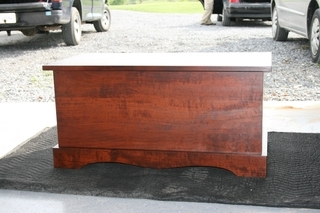 "We had a custom toy chest made by Lighthouse Woodworking. We loved the personal service and attention to every detail. The custom ordering was easy and the delivery timely. 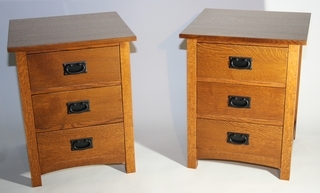 We will highly recommend Lighthouse Woodworking to our closest friends in the market for traditional custom made furniture." "Thanks for your diligence in making sure it is the right fit and form. 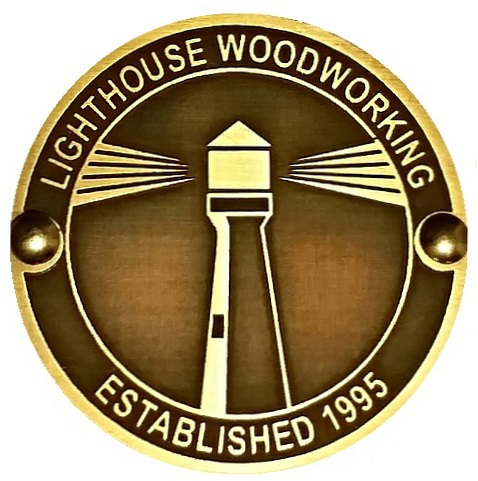 That's what I like about working with Lighthouse Woodworking; you guys take the time to ask the right questions to ensure 100% customer satisfaction the first time." "An instant classic. The tiger maple's intricate pattern is beautifully enriched by the finish. The slender legs add whimsy and balance the solidity of the wood. It serves well as a side table. Ours is a display table--my great-grandmother's hand tatted doily allows the tiger maple pattern to show through and we have '50s era portraits of my parents on top. Visitors always comment on the rich color and pattern." 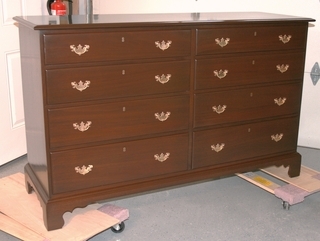 "We are so pleased with the stunning re-finishing job Lighthouse Woodworking has done on this dresser passed down to us. This piece was not usable as the finish was completely off the top. Ron went over and above what we expected. The skilled attention to detail and care is obvious." "Love the beautiful jewelry chests we purchased for our daughters! The hidden compartment and coin finish the craftsmanship beautifully. These chests will bring our girls joy for years to come and will make wonderful heirlooms!" 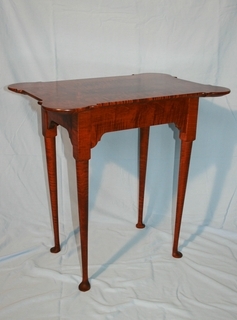 "Julie and I want to thank you for the beautiful work you did for our new dining room table. It is more than we imagined and it is a piece that will be in our family for generations. We can't say enough, we are so pleased." 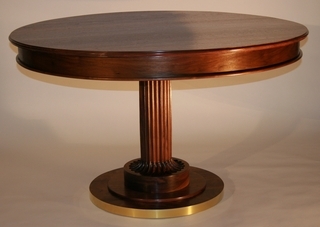 "I contacted Lighthouse Woodworking when I found out my ideal dining room table existed only in a picture of something made in 1908. Ron took this picture and created a stunning Craftsman-style dining table for us that perfectly reflects our style and which also meets the practical needs of a modern family. The quality of his work and the attention to detail is amazing, and exceeded any expectations we had! What made this project so special was Ron's collaboration with us, which started during the design process and wood selection and continued throughout the entire build. The end result has become a beautiful, much-loved centerpiece in our house that we will treasure for a lifetime. I highly recommend Lighthouse Woodworking to anyone looking for a special custom piece for their home." 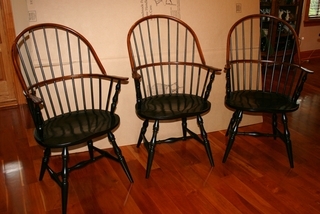 "Ron made four Windsor chairs to use around my kitchen table. It is rare for anyone to come into my kitchen without making a comment on how beautiful the chairs are. They are beautiful, however, the chairs are used every day so I wanted the chairs to be beautiful and comfortable. Somehow through the magic of design and craft, Ron managed to form each chair's contours to fit the human body. Presto, I got my wish." "Ron Light is a true craftsman! Our nightstands are exactly what we wanted. Ron kept us informed every step of the way and we couldn't be happier with the final product. Thank you."